Elio Altare has and continue to make one of the best Barolos in the Piedmont in northern Italy. Cut into the hills just below the town of La Morra and above the town of Annunziata, this is a lovely winery and their wines are highly sought after and celebrated by the prestigious Gambero Rosso as some of the best in all of Italy practically every year. The estate has won over 30 Gamberro Rosso Tre Bicchieri Awards. 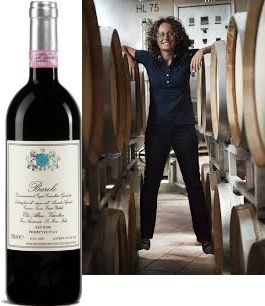 deVine is thrilled to have winemaker Silvia Altare with us to do a vertical tasting of their Barolo. Silvia has been working besides Elio since 2000 and more and more now she runs the show while she continues her father’s innovative approach and relentless improvement in the horticulture and winemaking. While the wines of Altare remain faithful to the elegant and plush style of wine produced in the sand, marl and tufa soils , they contain a freshness and concentration that is a notch above the rest. All this comes from a strict regime in the vineyards, adopting new vinification and aging techniques in the cellar. The Barolos are amazing and lovely, with an excellent balance of tannins and acid, their fragrance a haunting reminder of what it means to be Barolo – soil, perfume and elegance. The estate practices organic viticulture. We will feature a vertical of the Elio Altare Barolo’s which are always exceptional and more cru than normale, including 2010, 2009, 2008, 2007, 2005, 2004 and 2000.
international superstar, extremely limited and especially brought in for this tasting as a great way to end the evening. If you love Nebbiolo or would like to learn about this grape, this is a not-to-be missed event of the fall season. You will be thrilled by the arresting nose that changes continuously, and a sensual palate that matches with food brilliantly. There is a reason why Barolo is called the ‘King of Wines’ and the ‘Wine of Kings’. Only 18 spots available for this sit-down Winemaker’s event. You can sign up here.. Celebrate Al Fresco at deVine this Saturday, August 22! Al Fresco, the eagerly awaited 104th-St. community block party and fundraiser, is almost upon us. Please save the date and come visit us and our neighbors for a full day of fun and festivities. Special thanks to ATB Financial – Downtown Edmonton Branches and the Downtown Business Association for sponsoring this great event. Your support is greatly appreciated! deVine Wines is assisting the 104th-St. community by managing the popular online silent auction in support of Edmonton’s Food Bank and community development. Bidding can also be done in person at deVine Wines until 9:00 PM, Saturday, August 22, 2015. To be fair to all bidders, online bids time stamped after 9:00 PM will not be accepted. Those who can’t come down can also submit their maximum reserved bids which must be sent to “info@devinewines.ca” by 9pm Friday night. Items that are currently located at The Helm and at the Eye Care Group will be centralized at deVine Wines in the afternoon to facilitate bidding. 11:00 AM to 3:00 PM – Join Derek Jackson from International Cellars to sample wines from Glen Carlou, South Africa. The Pinot Noir, Cabernet Sauvignon and “Quartz Stone” Chardonnay will be offered. 12:00 PM to 3:00 PM – Craft Beer Importers will be pouring a selection of fine beers. 4:00 PM to 7:00 PM – Join Ryan Everitt from Trialto Wine Group to sample wines from Vina Montes, Chile. The Sauvignon Blanc and Cabernet Sauvignon from the “Classic” series, along with the “Alpha” Syrah, will be sampled. We are excited to share this exciting day with a host of other activities in our neighborhood. With so many things to do, we can’t help but call August 22 Super Saturday! Come out and enjoy the best outdoor market in Edmonton! Please note all times listed are approximate. Programming is subject to change. Al Fresco festivities begin at 12:00 PM and run until 10:00 PM. 12:00 PM to 9:00 PM – Food Truck Heaven! Please check out the Farmers’ Market as well for additional trucks to visit. A great group of restaurants have teamed up to turn the Melcor parking lot into a fun place to meet for food, drinks and lots of fun. The Watering Hole is the parking lot located between the Armstrong Block and the Great West Saddlery Building. You can’t miss it. It’s the one with the arch over the entrance. Admission is $2. Admission cost does not include food and drink. The following restaurants and bars will feature extended patios to bring festivities right onto 104th-St. A perfect way to enjoy a great summer evening with friends! –	Cask & Barrel (starts at 12:00 PM – located south of Jasper Ave at 10041-104th-St.) Come check out their stage for some great live music! A host of merchants and vendors will be offering food and wares for your eating, shopping and exploration pleasure! –	Earth’s General Store – Open until 9:00 PM. Come check out their café! –	Couleur du Vin Salon & Spa – Massage chairs on 104th-St.
–	Edmonton’s Food Bank – Our charity of choice for Al Fresco 2015. Information booth and truck located south of Jasper Avenue. –	ATB Financial – Corporate sponsor for Al Fresco 2015. Apply for financial services and receive a Front of the Line Pass to the Al Fresco Watering Hole. Information booth located on the corner of Jasper Avenue and 104th-St in front of the old Sobeys entrance. Music in the Park – Enjoy live music in the newly reconstructed pocket park located next to the Icon I Tower. 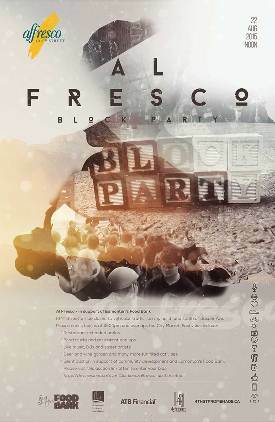 Performing DJs – Various DJs will be pumping out the tunes at Al Fresco throughout the venue. The party continues at Mercer Tavern after the patios shut down. We hope you can all come down Saturday for the festivities – and please remember to bring items for the Edmonton Food Bank. deVine Wines Supports Edmonton’s Food Bank! At deVine Wines, we been working feverishly to help bring back Al Fresco, the 104th-St. block party and fundraiser. This year, the event will take place on Saturday, August 22. Funds raised will benefit Edmonton’s Food Bank and community development initiatives. Patrons coming down to Al Fresco can help by bringing food items with them. Food can be dropped off at any of the following locations below. Fresh food can be dropped off at the Farmers’ Market Information Tent located at the intersection of 104th-St. and 102nd-Avenue. Food can also be dropped off at deVine Wines, Earth’s General Store, Mercer Tavern and Shoppers Drug Mart (Edmonton City Centre East) at any time before the event. 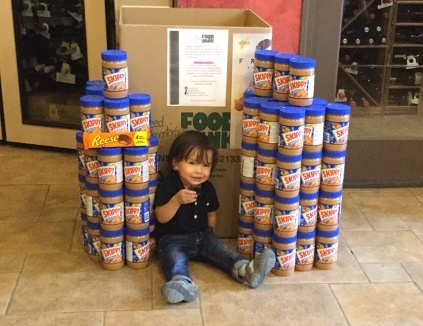 Please add to our wall of peanut butter being assembled and built at deVine Wines. Bring your jar and let’s see how big and high of a pile we can build together! Pictured here is Rhys Cordero, one of our young partners in the deVine family. Rhys happens to love peanut butter, as you can see by his enjoyment of his Reese’s Peanut Buttercup. Peanut butter makes Rhys smile. He’s hoping you can help us make a whole bunch of other little kids just a teeny bit happier too! Quick Fact: According to the Food Bank about 850,000 Canadians use the Fook Bank every month. In Alberta, 43 per cent are children. You can help support Edmonton’s Food Bank and community development by bidding in the online silent auction currently underway. To place a bid, please follow this link here.. If you would like to donate an item to the auction, please contact the store by phone at 780.421.9463 or by e-mail at info@devinewines.ca for more information. Many of the merchants on 104th-St. will have donation boxes on their premises.